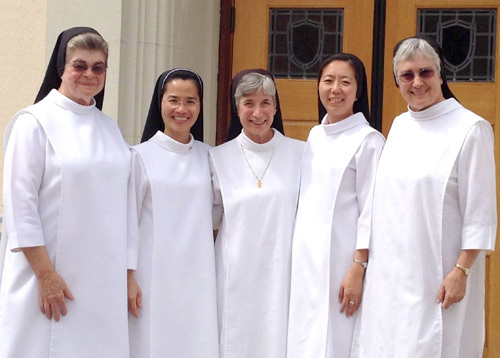 From left: Sister Patricia Ann Smith, formation director; Sister Mary-Han Nguyen, Sister Gloria Marie Jones, S. Mary Yun, Sister Pauline Bouton, formation director. On the Feast of St. Dominic, Aug. 8, Sister Mary Yun, OP and Sister Mary-Han Nguyen, OP made their perpetual profession to Sister Gloria Marie Jones, OP, congregational prioress of the Dominican Sisters of Mission San Jose. The motherhouse chapel overflowed with sisters, guests and family members gathered from California, Texas, Illinois, Canada and Vietnam. The main celebrant and homilist, Most Reverend Michael Barber, SJ, Bishop of the Diocese of Oakland was joined by motherhouse chaplain Rev. Carl Seewald, SVD, Rev. Tong Nguyen from Vietnam, Msgr. Manuel Simas, pastor and Rev. Anthony Huong Van Le, Parochial Vicar at St. Joseph Parish, Fremont, Rev. Dominic Quyen Bui from Toronto, Canada, Rev. Steve Niskanen, CMF, from Chicago, Illinois, and Rev. Jeff Finley, CPPS, former Motherhouse chaplain. Second in a family of four, Sister Mary-Han was born in Saigon, Vietnam, and entered the United States at age 16. Her parents and siblings live in Houston while her sister, Sister Theresa Trang Nguyen, LHC, ministers in Southern California. Sister Mary-Han holds a BA in Liberal Arts from California State University, Fullerton and an MA in Pastoral Ministry with an emphasis in Catechetics from Santa Clara University. Sister Mary-Han has served as Parish Faith Formation Director at Mission San Gabriel Parish and looks forward to continuing this ministry in September at St. Anthony de Padua Parish, Anaheim Hills. The youngest in a family of four, Sister Mary Yun was born in Suwon, Korea and entered the United States at age 12. Her mother and most of her family reside in southern California. Sister Mary holds a BA in Psychology from University of California, Irvine, a Master of Social Work (MSW) from UCLA and is a Licensed Clinical Social Worker. Sister has ministered in Catholic Charities of Los Angeles, Los Angeles County Department of Mental Health and Homeboy Industries, founded by Gregory Boyle, SJ. She will serve as the Dominican Sisters Vocation Director and continues to love her counseling and social work.